Product prices and availability are accurate as of 2019-04-20 02:14:29 EDT and are subject to change. Any price and availability information displayed on http://www.amazon.com/ at the time of purchase will apply to the purchase of this product. 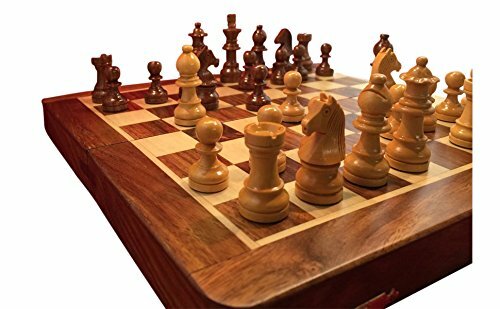 Get years of enjoyment from this high quality travel chess set, crafted from premium Golden Rosewood. Perfect for players on the move, or for anyone who needs a sturdy and compact analysis set. No set of higher quality is sold at this price anywhere. 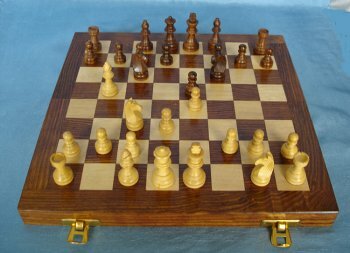 This Golden Rosewood and Boxwood set unfolds to a playing area of 10 x 10 inches, with each square a full inch in size. 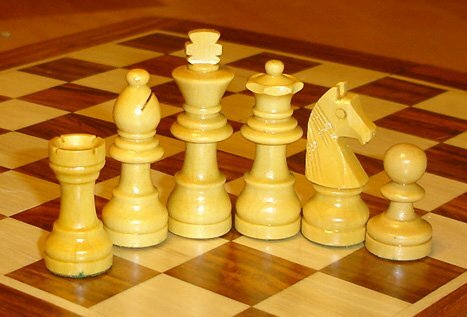 The Kings are handcrafted from Golden Rosewood or Boxwood, and measure 1.75 inches tall. Each wooden piece contains a magnet strong enough to be stable on bumpy roads and turbulent flights. When folded, it is a compact 10" x 5" x 2" and easily slips into a briefcase or knapsack. 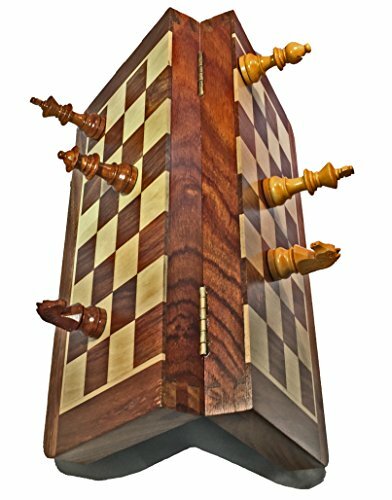 Here is an outstanding magnetic travel chess set that will last a lifetime! 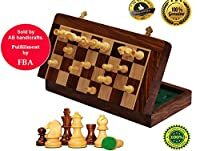 Premium quality Golden Rosewood magnetic travel chess set. Compact folding set, with very strong magnets - perfect for players on the move! Beautiful and sturdy set for portable analysis! Handcrafted in fine Golden Rosewood for the dark pieces and Boxwood for the light pieces. The King is carved from either Golden Rosewood or Boxwood, and measures 1.75 inches tall. Folding to a compact 10" x 5" x 2", it slips easily into a briefcase or knapsack.